Manufacturer & exporter of Expansion Bellowes. Expansion Bellows offeredprovide support for effectively absorption of thermal expansion, vibration, noise from pipeline systems. 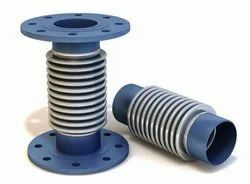 Further, its use supports effective elimination of pipeline residual stress due to minor deviations in piping connections. Some of its features include suitable for use in high temperature work areas, superior anti-fatigue performance, offering high working flexibility support, superior resistance to corrosion, suitability for use in industry sectors like petroleum, chemical, metallurgy, mechanical, construction and others; available in industry standard options of ASME, and other national standards, different material choices like stainless steel, alloy steel, carbon steel and others.